OMAHA, Neb. (KMTV) — Last week, 24-year-old Sergio Rodriguez-Lopez was injured while fixing potholes near 120th and Blondo Streets. "We don't know how many days he'll be like this. How many weeks...or however long it'll be." Outside of the hospital where her brother-in-law fights for his recovery...Andrade recalls last week, when she got the call no family member hopes to get. "When I got to the hospital, it was very emotional. Everyone was gathered...I saw my sister, his wife crying, our family. So when I got here, I imagined the worst." Rodriguez Lopez suffered a critical head injury after a pickup rear-ended his work truck. "His brain is swollen. So they had to remove the cranium so the brain could expand. Right now he's only semi stitched up because When the swelling goes down, they have to put the cranium back. BUt right now his head is....i mean we really only know it's him because the doctors tell us it's him. He's unrecognizable right now. His face is purple..his head is this swollen." 44-year-old Steven May was driving the truck that rear-ended the work truck...a work truck that had a signal arrow bar attached. The signal arrow bar ended up on May's windshield. Other members of the work crew were also injured but were ok. Rodriguez-Lopez remains at CHI Health Bergan Mercy with internal and cosmetic injuries and has not woken up since the accident. Andrade says, "He also has three broken ribs on one side and four broken ones on the other. One of those ribs ruptured his kidney." 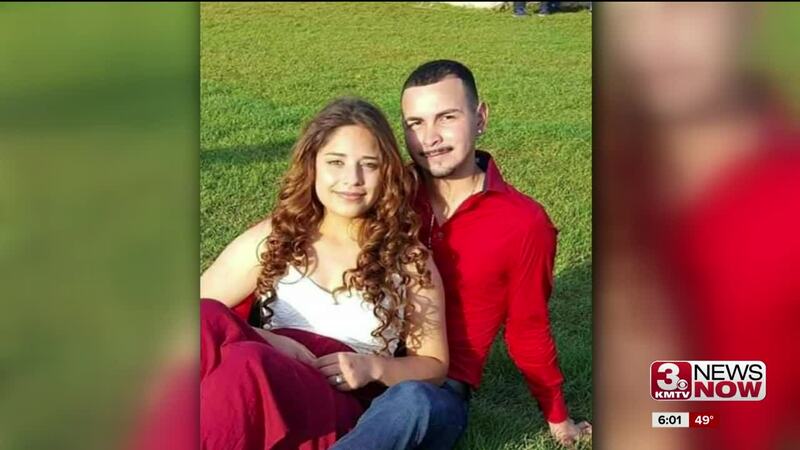 Now his family, including his pregnant wife...who had just found out she was carrying their first child the week before his accident...are praying for him to wake up. Andrade says, "We hope others join us in praying for my brother-in-law because the more prayers he has, the stronger the prayer and the more the man upstairs can hear us." "Right now, we aren't interested in the driver and if he's facing charges or not. That doesn't help us in any way. What WE want, is for Sergio to wake up. To recover from this. Because he's a young guy. He's barely 24 years old. We want him to wake up and be with his wife and family." "We don't always take the precautions that we should when driving. And look what happens. Because especially when there's working crews, we need to be careful because ultimately they're out there for us. They're repairing our roads. Because we all know that with the potholes, it hasn't been safe. So this happened to my brother in law, but it affected us as a family, even the family of the guy who caused the crash. There's so many of us who are impacted by this now."